Remembering to breathe is hard isn’t it? Don’t get me started on having to blink all the time, I don’t know how I get anything done. Actually no, it’s super simple, something we don’t even have to think about. Unfortunately for Sam that’s not the case. 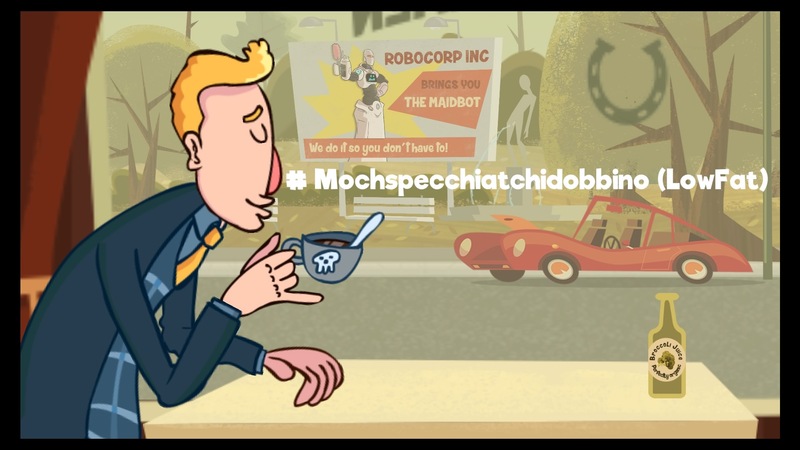 He has to think really hard about every action he takes in Manual Samuel, a new release from Perfectly ParaNormal on the PS4. You play as Sam, a man who has never had to work or think for himself ever thanks to his rich parents. His long suffering girlfriend decides enough is enough however and smashes him across the face with a bottle. In his dazed state Sam walks into the road and gets himself killed by a truck. Upon arriving in Hell he meets Death who quickly sees how rich Sam is and strikes a bargain with him, survive a day by doing everything manually and he’ll bring you back to life. 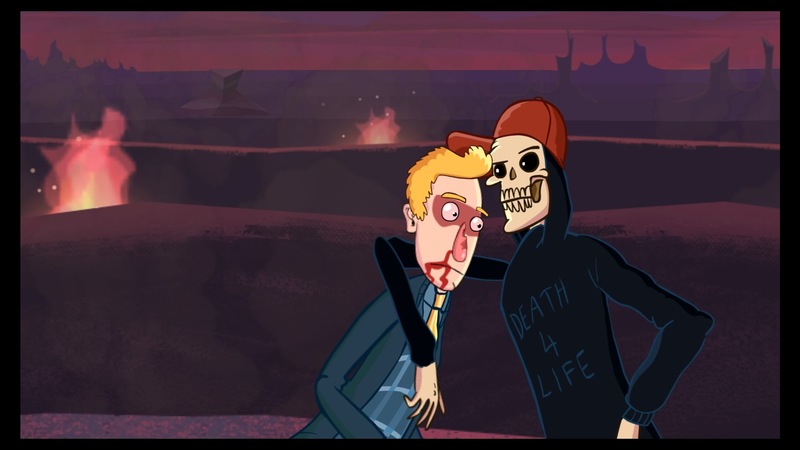 Death tags along to keep an eye on you and the buddy movie pairing is complete. 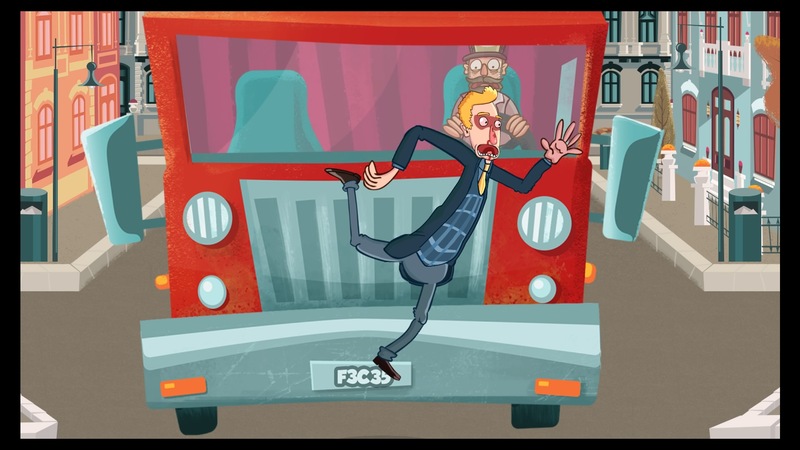 Manual Samuel isn’t a serious game. You’ve got a narrator talking over everything, there’s not a second that isn’t filled with a joke or visual gag and Sam’s movement just can’t be taken seriously. I’d describe it as amusing, rather than funny. I didn’t laugh out loud but I wasn’t cringing at the attempts at humour either which considering how constant it is is pretty remarkable. The tasks start off pretty mundane but build as the day gets closer to ending. There’s a trophy for watching all the cutscenes but it wasn’t difficult to resist skipping them and that’s a good job as that’s what will keep you playing. The gameplay is best compared to something like Octodad: Dadliest Catch where you are tasked with doing very basic things but the controls are such that it’s easier said than done. Walking is done by alternating between L2 and R2, if you accidentally press the wrong one Sam does the splits and you need to press the opposite button to right yourself again. You blink with the cross button, as the screen quickly becomes blurry and washed out if you aren’t doing this regularly. If you fail to breathe then Sam will eventually collapse, so you need to hold the square button to breathe in and then the circle button to breath out. These actions are constant, whatever else you’re doing you’re going to need to get about and be able to see and stay alive. Hand actions tend to work on the R1/L1 buttons. If you’re picking something up you’ll need to hold it and then if you need to use whatever you’re holding you’ll need to tap that same button again or if you’re raising something to your mouth you may need to tap the triangle button. As you can probably tell you’ll be concentrating hard to make sure you’ve got the right fingers doing the right things. Very early on you need to get ready for work so you’ll need to walk to the left (and possibly correct your spine by pressing up on the d-pad every now and then), get to the bathroom to brush your teeth by holding the tooth brush and tapping the triangle button constantly, go to toilet by tapping L1/R1 to make sure your aim is right and have a wash which involves holding L1/R1 and holding different buttons for different parts of the body. Later you’ll be getting dressed, eating breakfast, driving a manual car to work and actually performing your job as today is the day your dad decides you need to start pulling your finger out. As you can imagine the tasks become more complicated as you progress requiring you to do more or within a time limit. You can’t actually fail from what I can tell, it’ll just take you longer to complete each task if you’re falling over constantly or dropping things. Even in the few ‘boss battles’ if your health bar depletes then you just have to wait for it to refill a bit before carrying on. Which is a good thing, you don’t need to be forced to do sections over again due to a controller slip up, that would be no fun at all. Everything is presented in a 2D flash style which generally works well. Some things are drawn better than others and when the camera is zoomed in a lot in cutscenes you can see the original artwork was drawn to be viewed from further away as it becomes a little pixelated but overall it’s a good look and I know when I saw it on the PSN Store it stood out amongst all the retro graphics. Manual Samuel isn’t that long, I probably completed it in about two hours. Even with the short running time some of the scenes felt like they went on a little too long, repeating the same actions a few too many times. The game as a whole doesn’t outstay its welcome however and if you are left wanting more then upon completing each level you unlock a time trial version of it where you can race to complete the stage in a bronze, silver or gold time if you fancy. The trophies are pretty generous as well with a few for doing specific things but nothing too irritating. If you need to return to a specific chapter you can with a chapter select. 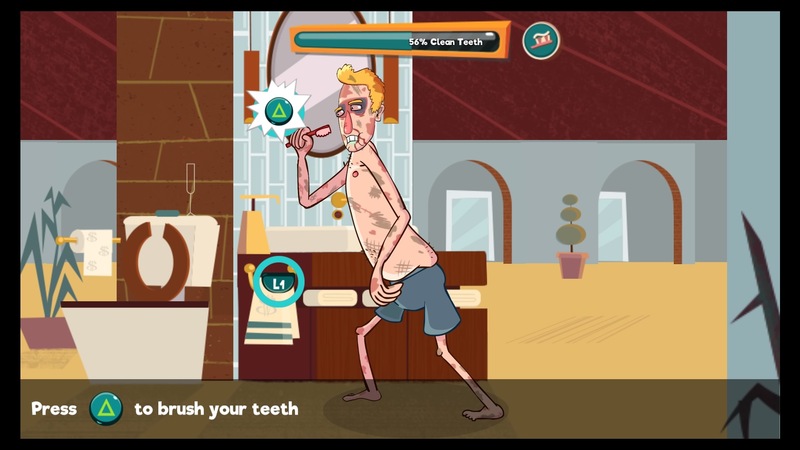 Manual Samuel is a reasonably priced game for what it is. I enjoyed my brief time with it, found its attempts at humour to be consistently charming if not laugh out loud funny and the core gameplay is different enough from the norm to keep you interested for its short running time. The humour, gameplay and art won’t be for everyone but this is a breath of fresh air amongst all the retro styled rogue-likes out there. 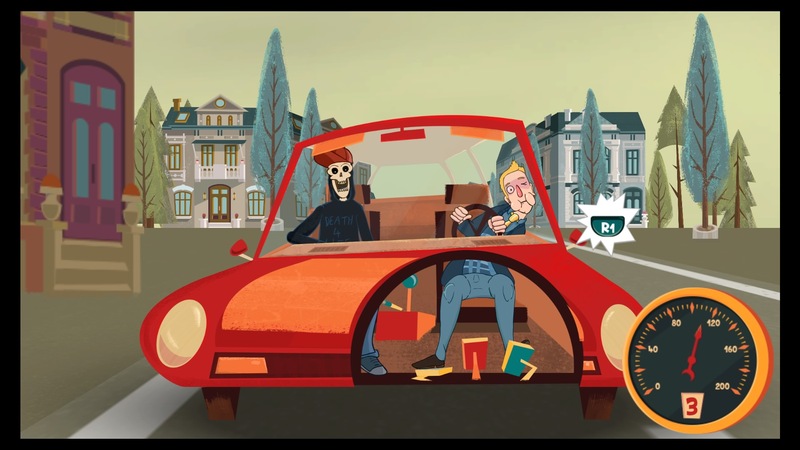 For its price Manual Samuel is a short but fun experience that won't outstay its welcome. Some scenes can become a little repetitive but the novelty will carry you through the majority of the game and the humour will take you the rest of the way.